It had to be one of Nebraska's biggest wins ever as the Cornhuskers upended highly touted Penn State 42-17 before another sellout crowd in Memorial Stadium and ABC-TV. Things looked grim for NU in the early going as the Nittany Lions jumped out to a 14-0 lead with 3 minutes left in the first period. But then the dam broke as the Huskers flooded the scoreboard with points - 28 to be exact - in the second quarter. The big hookup came with quarterback Tim Hager to tight end Junior Miller as the two teamed for two touchdowns of 11 and 70 yards. 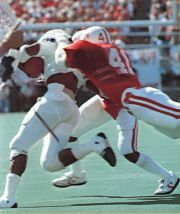 But Hager and Miller were not the only NU stars as Jarvis Redwine and Kenny Brown both played outstanding. Redwine finished the game with 124 yards despite not starting and Brown made several great catches and scored on the ground from 16 yards out. In the second half, the Blackshirts held Penn State to just 3 points, in fact, the first-quarter Penn State touchdown would be the last the NU defense would give up for 20 straight quarters.